Diesel is a Pitbull and a therapy dog, which makes him pretty unique. 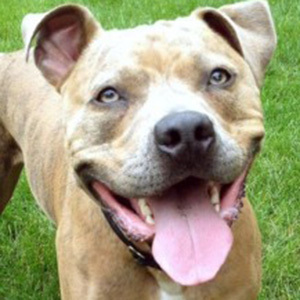 Kim describes Diesel as a very sweet lapdog who loves to entertain everyone. Oh, and he’s also an actor and model! Diesel was cast in the movie “The Jingle Dress” and recently was a model for Target’s Halloween costumes. Diesel is very smart – Kim says he picks up on everything very quickly…which can be a good thing or a bad thing! He knows several tricks including: shake, high-five, roll over, play dead, spin, speak, bear, wave, kisses, hugs, go find, sit pretty, and will also jump into Kim’s arms. Diesel absolutely loves children, and they adore him for all the tricks he performs. In his spare time, Diesel enjoys running with his mom, visiting the dog park, snuggling with his sister Daisi (a five-pound cat), and giving love to everyone who wants it.